Installation seat belts in coaches. The requirement to install seat belts on all seats of passenger vehicles, will be from October 20, 2007, for vehicles to enroll thereafter. The use of seat belts today is not regulated. The compulsory use of safety belts, is collected by Directive 2003/20 / EC, which should have been transposed into Spanish law before May 9, 2006, since this point has not occurred, is not compulsory until the standard, which is in the pipeline are not transposed. They can not be installed because safety belts in vehicles registered, unless they have been approved for this purpose in accordance with current regulations. It is from the October 20, 2007, when it will not register any vehicle that is not equipped with seat belts for all seats. All in compliance with Directive 2005/39 / EC 2005/40 / EC 2005/41 / EC and 2003/20 / EC, pending transposition. 1) Keep calm. Leave the bus quickly leaving your personal items. 2) Use the doors and, if necessary, to the nearest exits and accessible emergency. 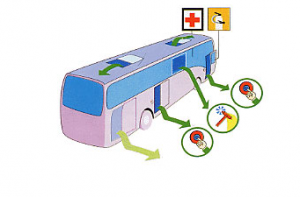 3) Move away from the bus. Move to a safe place in relation to traffic. 4) If minor fire, use the extinguisher as directed. If the fire spreads and produces abundant smoke, leave the vehicle quickly. .
5) Report to the emergency services. Doors and accesses, find them. Avoid all precipitation to enter or exit the bus. It is a professional trained especially for this work. The vehicle is its “security specialist.” Follow their instructions. The opener is in sight, near doors.You must use with the vehicle stationary. When activate, the doors are unlocked and will open immediately.. If your seat has, faste it. It is located in the front of the car, usually near the driver’s seat. The cristall hammers are near windows marked as “emergency exit”. • Arches and antideformantes rollover safety. • Seats with anchors as standard R80. • Equipped with safety brakes and ABS anti-skid ARS. • Hydraulic Retarder, with automatic adjustment of maximum speed. • Emergency exits, doors and windows. • Bodies resistant front and side impacts. • detection control systems to ensure the correct driving times. • Preventive Maintenance of the fleet itself.